Every year, the Korean Mahjong League (KML) organise an online mahjong tournament on Tenhou. As of last year, there were participation of 7 countries. We are expecting 9 countries (Singapore and Vietnam to join) this year. Each country will send 4 representatives. It will be held in around November and the timing is around 4pm. A 1-day tournament of 3 han-chan of round-robin and 4th han-chan by ranking. While I don’t know any players from these countries, if you are lucky, you will get to play with ASAPIN from Japan, a Japanese player with Tenhou rank (11 dan). So we will be organising quite an extensive tenhou tournament to select the strongest 4 players to put up a good fight against them. It will be tenhou rules except that there is no buttobi. Aka ari/Aka nashi to be confirmed. By default, 2 han-chan will be played on 9pm on Sunday, Tuesday and Thursday. The first game will start on 19 June. These are subjected to changes depending on players’ availability. Note: Players registered will be confirmed every multiple of 4. It will be danish ranking system (The strong vs the strong). For the 1st round, 6 han-chans will be played, followed by elimination of 4 players. After every elimination, every player’s total uma score will be halve before proceeding to next round. Subsequent elimination will be done with 4 han-chans till there are 8 players left. So the finals is 8 players with their score reset. These 8 players will be played according to 1st vs 3rd vs 5th vs 7th on 1 table and the rest on another table. They will play with the same players for 4 han-chan. Each han-chan there will be a switch of players position (In the MCR way) such that every player will get to be 1st,2nd,3rd,4th oya each. After the finals are played, the top 4 in terms of total uma score will represent Singapore. The 5th to 8th players will serve as reserve in the order of rank. Players are welcome to join for fun however only a maximum of 2 of such players are allowed to enter the Finals. 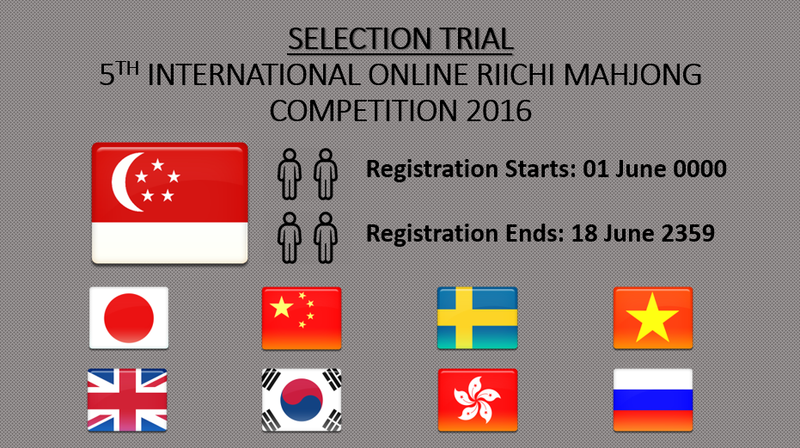 REGISTRATION STARTS ON 01 JUNE 12PM! Once you are added to WA group = you are confirmed. You will be added according to the priority order listed as above.